Wood curio cabinet with three shelves, a glass door and glass side panels. It can sit on a table or be hung on the wall. Measures 12 1/2" tall x 13" across and 2" deep. The shelves are 3.5" deep. It has a magnetic door latch and a cute door pulls. Great looking cabinet to display your miniatures in. It has a crackle finish and a marbled background. Space between shelves is from 3.5" - 3.75". 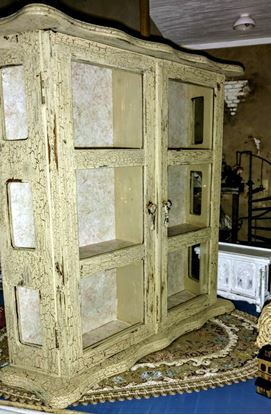 Sale is for cabinet only, no accessories are included.